Hi, I am more active on Styleforum with lots of references over there. Please visit my profile if you have any questions. Used quite a bit but still a ton of life left. The taping in some areas is coming off, but doesn't affect the water resistance at all. I have never experienced any wetting out with this jacket, so I never really bothered to get it fixed. If it's something that really bothers you, it's not an expensive fix. Up to the details: Amazing dermizax waterproof fabric (I just had this reproofed as well, so repellent-cy is at 100%). Cool visored cobra style hood that will cover your whole head, , drawstring hood, button cuff closure, and best of all an amazing silhouette-- closed or open. 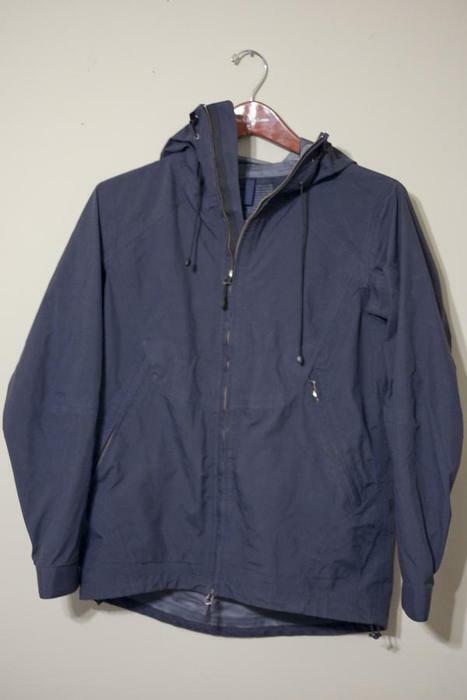 A great casual piece for outdoorsy stuff as well (it has served me well in cycling and hiking situations) or just plain bein' a rad visvimy type dude, without the visvimy price. Retail was over $600, get it for a fraction of the price. Note that I took the little dermizax branding patch off, affects absolutely nothing but I preferred the sleeker look. Please PM me any questions you have. Great Plokhov shirt, slim fit. Best for 44 or a slim 46. Worn once or twice, too tight for my liking now. Very, very soft fabric and great collar/drape. Sorry for the blurry photo. The color is a bright white, not creamy like the stock photos. Bump, stuff sold, ToJ added! up, all the old stuff gone, added tons of new things! updated second post with more stuff! schneider shirt and our legacy archive blazer! Up, price drops as well as new items added. Stuff gone, nonnative, Oliver peoples, and Plokhov still available! Oliver Peoples gone, Plokhov hidden placket shirt (just dropped the price on this) and Nonnative parka still available. Last week before it goes off to ebay.